Morningside Heights is know for many things: V & T Pizza, The Hungarian Cafe, Saint John The Divine, Columbia University and Saint Luke's Hospital are some of the many things. These places are also part of what gave Morningside Heights a very distinct institutional flavor throughout the 19th century. 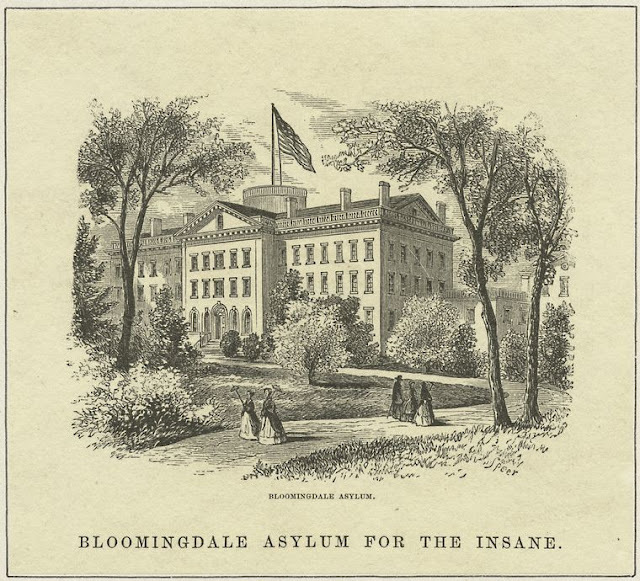 Beginning in 1821 with New York Hospital's Bloomingdale Insane Asylum (now Columbia University) and the Leaks Watt Orphanage (on the site of Saint John the Divine), the area north of 110th street west of what is now Morningside park was sort of an institutional acropolis. The "Heights" was / is a plateau, public transportation was practically non-existent (except for streetcars) until the subway opened in 1904. The 9th avenue el swung east then north at 110th street and headed in to the plains of Harlem while these institutions were built and gave way to new institutions. This is the Bloomingdale Insane Asylum. New York Hospital began this institution down in the city proper, on Broadway and Duane Street, across from where our City Hall was eventually built, in pre-revolution New York (the British built city hall was on Wall Street where Federal Hall National Memorial now stands). The city was constantly growing, up the island and New York Hospital began buying land in what is now Morningside Heights (and just a little south of 110th as well) in 1816 and by 1818 had purchased 26 acres. Using the land uptown would provide ample room for a farm, upon which the patients would work. Believing that this would be therapeutic, it was incredibly forward thinking as asylums in the early 19th century were not anywhere near as enlightened. This is only part one, more later. 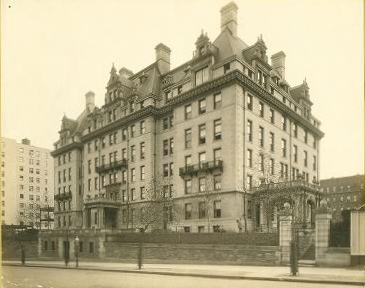 This is The Woman's Hospital in it's original location, 50th and Park Avenue, now the home to the Waldorf - Astoria. Built on what was once a burial ground for cholera victims from an 1832 epidemic and after digging up thousands of coffins, the hospital opens in this building in 1867 after starting in a temporary headquarters on Madison Avenue and 29th Street. The hospital was founded by Doctor J. Marion Sims and Sarah Platt Doremus. Doctor Sims was, and is, a controversal figure in medical history. Although there is a statue of him in Central Park at 103rd street and Fifth Avenue, even though he is the first physician to depicted in statue form, although he developed a few procedures and had been referred to as the the father of American gynecology, there are some lingering questions about him. Between 1845 and 1849, while working in Alabama, some of the procedures he perfected probably involved subjects who were not given the recent innovation of anesthesia. Sarah Platt Doremus was a well meaning philanthropist who did a great deal of mission work and in 1860 she founded the Woman's Union Missionary Society, "designed to elevate and Christianize the women of heathen lands". Her philanthropy extended to homes for aged women to bringing religion to prisons to establishing a home for recently released female convicts. The railing at the bottom of the print was to separate pedestrians from the tracks of the Harlem River Rail Road. This is the hospital after it moved to 110th street and Amsterdam Avenue in 1906. This is looking south east and the site is now occupied by a Con Edison substation whose front doors on the Avenue look like the front door to the Land of OZ. As tarnished (tarnished is being kind) as Doctor Sims background may be, he did fight for women's health issues, advocating for the treatment of cancer. In 1871 Sims returned to New York (after a very colorful career in Europe), and after quarreling with the board of the Woman's Hospital over the admission of cancer patients, went on to found a new hospital, later to evolve into the Memorial Center for Cancer and Allied Diseases. 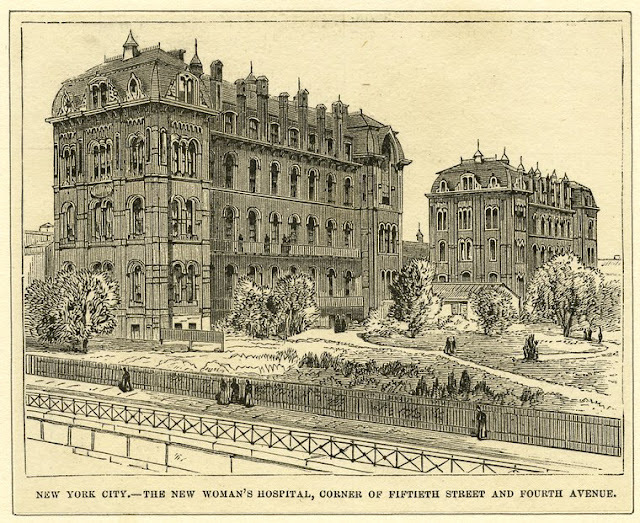 Woman's Hospital, the first hospital for women in New York, was eventually absorbed into Saint Luke's Hospital which made the leap to "The Heights" from it's original 1858 home on 54th street and Fifth Avenues to it's new and current home home in 1896. In 1953 Woman's Hospital became part of Saint Luke's and in 1965 the Woman's Hospital was moved to 114th Street and Amsterdam Avenue, just across the street from St. Luke's. The 1906 building was torn down not long after.